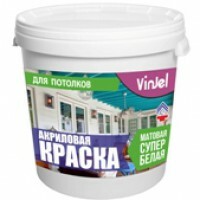 Acrylic paint for ceilings matte super VinJel, base And 1.5 kg. PAINTS FOR CEILINGS SUPER WHITE 1,5kg based on acrylate copolymers. It is intended for pa..